I found some hilted german swords!! :-) I'll post them on saturday. 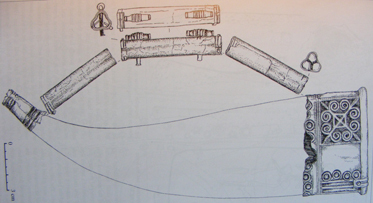 Stephen, according to István Bóna (in the "Migration period sword" topic) it is an easter sword of iranian origin. F.e. the swords in the 5. picture in my first post there are iranian (ok, sarmatian. At that time was the ruler class in Persia, Khusan, and Baktria sarmatian, and their warriors were bodyguards in most of the Asian countries). I just looked at the 5 drawings in your post on the migration period sword thread and I'm sorry but I still dont see any resemblance between them and the Stilicho sword, but then again maybe I could be missing something. I'm no expert in persian arms but I always thought that their swords would rather look like the one Shapur II. is depicted with on this 4th century silver dish. 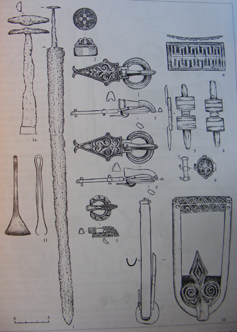 During my brief web search I didn' t find any other kind of sassanian hilt design then this until much later. 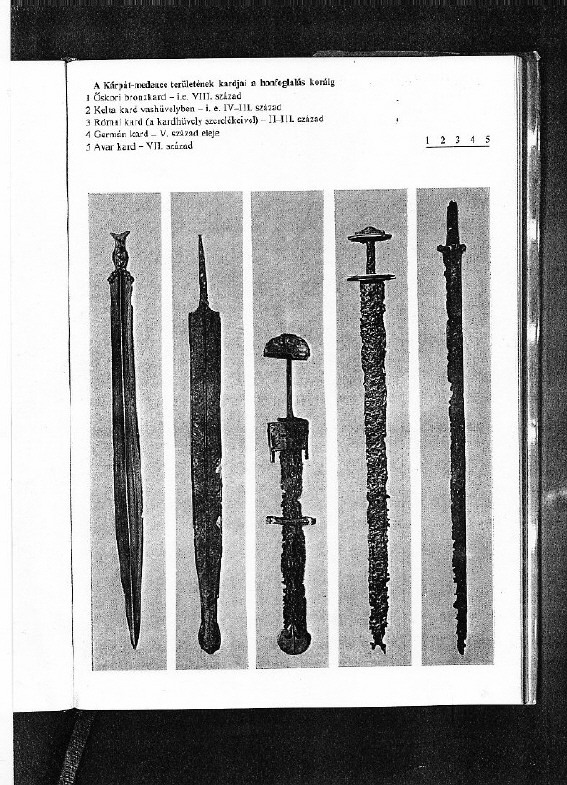 Also Henrik stated that these swords would rather be sarmatian then sassanian swords. Have similar swords been found in Persia? And I finally would disagree with your opinion that the pommel of Stilichos sword looks like the pommels of the sarmatian swords we currently speak about. The vase shaped pommels of the sarmatian swords are very different from Stilichos. His pommel looks either mushroom shaped (there ring some bells in my head, I will look into my library later on, I think I've seen this somewhere else already...) or like a small upper guard with a rounded pommel. Definitely not sarmatian to me. Stilicho was born somewhere in Pannonia, near to the "Iaziges metastanse" (after the map of Ptolemai), the sarmatian territories in the Hungarian Great Plain. I think this is a good point for the steppe ogigin. In 405 the vandals crossed the Rhine with the alans, therefore a close relationschip of the two tribes is assumable. This case was the same 200 years before, with tha alans and the qauds and markomanns. Is it just me, or does this sword look a lot like the Honorius and Stilicho ones? I know that this sword is dated to a couple of years after the Honorius and Stilicho ones but its possible that there is another example that I'm unaware of that is more contemporary. this sword does definetely look like the ones from the ivory dyptichs. But given the distance in time, there might not be a significant connection between them. At least this specimen gives an example of western spatha which approximates the swords on the ivory carvings.. I now have looked through all of the relevant books in my shelves and the university library without finding what I was looking for. I remember a very similar mushroom formed pommel construction I think it was of eastern origen, but I don't know were it could be, must have been in a exibition catalogue owned by one of my friends. This is to my mind, a better fit for the swords of Honorius and Stilicho. It comes very near to what I am thinking of. Thank you Till, for posting that pic. It is an interesting sword indeed, its seems to have some fairly unusuall features, in fact I have a hard time imagining what it would have looked like new. I'm still hoping someone can attach a larger pic of the Frankish sword (the one with a gold plated grip and silver sonnel) from the above link. I would do it myself but I can only access the internet from my phone at the moment. I would love to see a better quality image of that sword, thanks in advance. IDuring my brief web search I didn' t find any other kind of sassanian hilt design then this until much later. "With the eastern Huns common double edged swords and daggers of Persian type" and "pallash-shaped Hunnic swordtype of Sassanid-Persian origin." To the Stilicho diptych, Bona says "The sword, hanging from an Iranian-inner Asian belt, is not comparable to contemporary images, and betrays oriental, probably Hunnic connections." I'm not an expert on Persian weapons, but the rest of Istvan Bona's book "Das Hunnenreich" (Konrad Theiss Verlag, 1991) seems to be well researched, so I trust his opinion on this matter as well. But regarding the time-frame, the website says 400-450 C.E., From Kerch. So that is Stilicho's time. The diptych was carved in 395, according Wikipedia, so if both dates are correct, then it would be possible that Stilicho's sword is related to this one. Surprise! 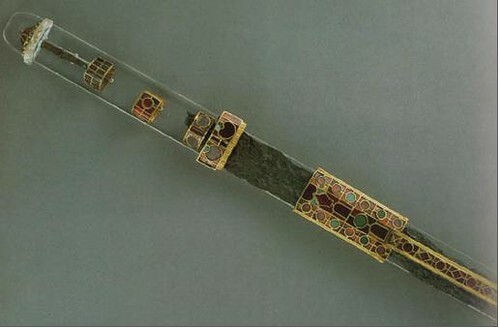 Sword aged 4th-5th century from Baltic lands,Taurapilis cemetary. Hey Arunas, thanks for sharing those pics, love the chape on that one. 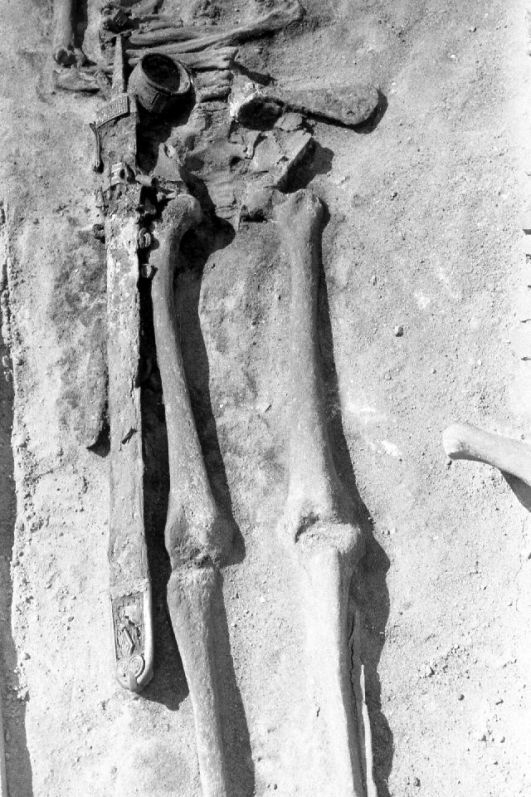 Those are great photos of the sheathed sword shown, in context, with the remains of the owner during mid-excavation. Thank you so much for sharing these photographs. Don't overlook the beautiful axe head laying on his other hip! What is the cylindrical object near the hilt of the sword? Yeah, Lithuanian axes from that period are really beautiful.I promise in near future shall place some. The cilindrical object is a silver binding of drinking horn. Another interesting thing to the left of the sword is bronze pincette,quite popular part of the kit in 4th-5th C in Lithuania.A tool for higiene? Here is full set of sword and scabbard details. Another "spatha" from Baltic tribe Yotvingians cemetary Shwaicarja dated 4th-5th C.
Really interesting swords! Thanks for sharing! Interesting sword for such a remote region. It seems Germanic, resembling one of the swords from Krefeld-Gellep, dated to the early 5th. C. But why does a Germanic sword end up in the Baltic? Also, could you tell me a bit more about the method of dating of these swords? If your sword is significantly earlier than the one from Krefeld-Gellep, it may mean that for some reason the Baltic was somehow earlier with that style. I thought that that style was a development from Roman forms, but if "your" sword is earlier, then that may not make much sense. In return of the Taurapilis burial date, there are some means by that was settled a date.Firstly, East Lithuanians(Taurapilis burial is within their area) in the end of 4th - the beginning of 6th C buried their dead not burned(from the begining of 6th C they begun burning their deads).All entombed bodies was unburned.Secondly, date was settled by other artefacts,especially paillettes. This burial ground was investigated in 1972 year,when Soviet Lithuanian archeology was really poor,so unfortunatelly they couldn't use any modern technologies. In return of that grave No.5 (where the sword was founded), it is dated to the second half of 5th- the begining of 6th C. That is really interesting, that only one grave(so called "grand duke's grave") was with such luxuriuos imported artefacts,all the others in that Taurapilis burial ground founded artefacts,was common Eastern Lithuanian's things. Even in that grave No. 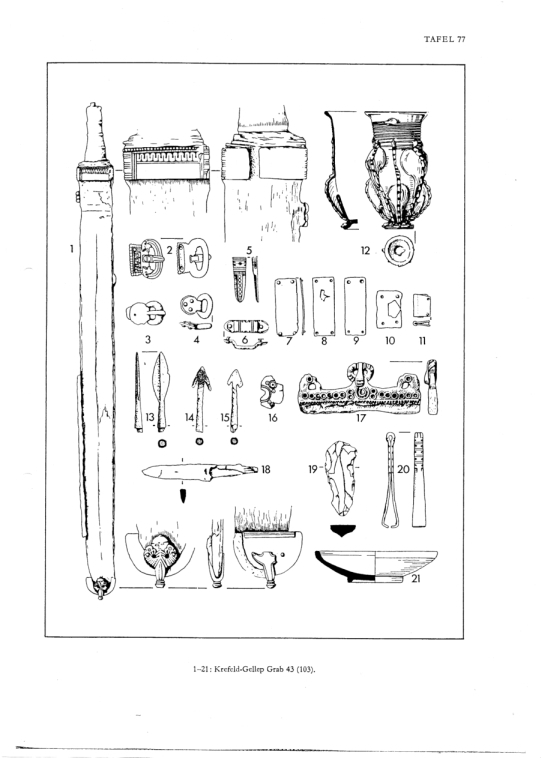 5 only sword with scabbard details(and some buckles and I forgot a drinking horn...)was imported,other things(an axe,spears,shield,paillettes and other) was common, Baltic.It seems that this man participated in some actions with Germanic tribes,maybe war march or trades. Second sword from Svaicarija is dated to the end of 4th - 5th C.
Coleague, have You some pictures of Krefeld-Gellep sword and acsesores?It's really interesting for me,because I'm going to make a replica of that Taurapilis sword,unfortunatelly there didn't remained any elements of handling and of course it would be greet to get some advices how that sword was carried accourding to all founded scabbard details. There was a long history of cultural exchange between the peoples of Scandinavia and the southern Baltic. Connexions have been documented for Himlingøje horizon in the 3rd century, for example. But although I'm no expert in baltic archeology, in the drawings you posted I only see items similar to the latest horizons of the danish bog offerings which are dated to the second half of the 5th century. 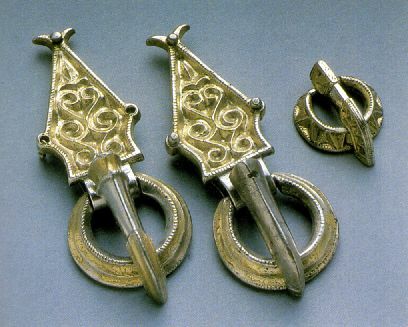 Blade, pommel cap, belt fittings, and scabbard parts are all typical scandinavian examples of later fifth century styles. 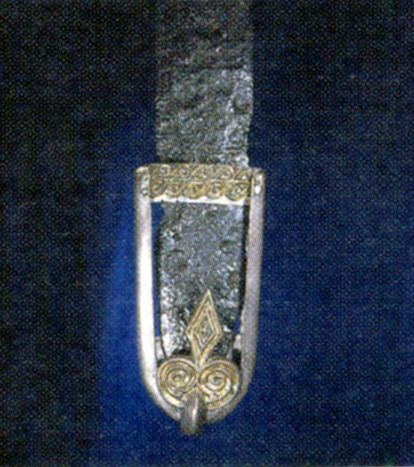 The buckles and scabbard chape and mouth are nice examples of northern kerbschnitt designs. 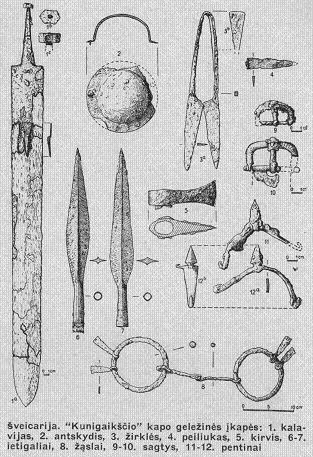 The same goes for the Shwaicarja burial - lovely boad swordblade by the way - all the stuff seems quite scandinavian to me, too (but maybe younger?). On the other hand, one should be carefull with ethnical implications, as I said earlier, the items traveled a lot and the concept of belonging to a certain ethnia by birth was unknown to the people of this time. So the whole matter is a bit messy. Could you post some pictures of the baltic stuff? What else was in grave 5 from Taurapilis? Would be realy nice to see that.